A vintage 1961 magazine clipping sized 5.5x9 inches that has been hand signed by the then, England u23 national team. 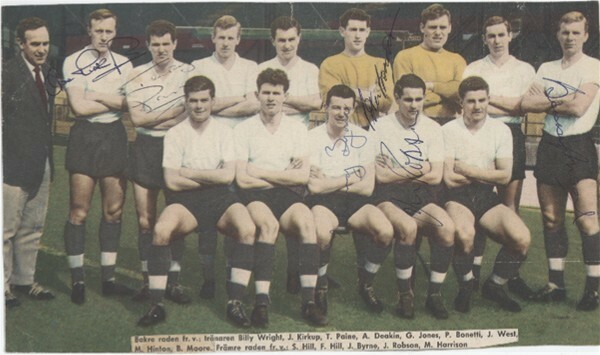 The clipping contains six autographs including the iconic Bobby Moore who five years later led the full team to glory in the 1966 world cup final. The signatures on the clipping consist of Joe Kirkup (west ham), Terry Paine (southampton), Peter Bonetti (chelsea), Bobby Moore *died 1993* (west ham). Johnny Byrne *died 1994* (crystal palace) and John Robson *died 2004* (derby county), all autographed extremely clear in blue ink.